Step 1 If making your own homemade labneh (so easy and highly recommended), do that at least 24 hours in advance. Follow this homemade labneh recipe. Step 2 Preheat oven to 375 degrees F. Line a large baking sheet with parchment paper and set aside for now. Step 3 Open the pitas and pull the halves apart along the seams. Using kitchen shears, cut the pita into triangles or strips (1-inch or so wide). Step 4 Toss the bread in a large bowl with the oil, a generous pinch of salt (scant 1 tsp), and the sumac. Taste and adjust salt or sumac to your liking. Step 5 Spread pita triangles pieces on the prepared sheet pan and bake until golden brown, about 10 minutes or so (watch carefully, and rotate pan half-way through). Remove from the oven and set aside for now. Step 6 Make the herbed labneh dip. 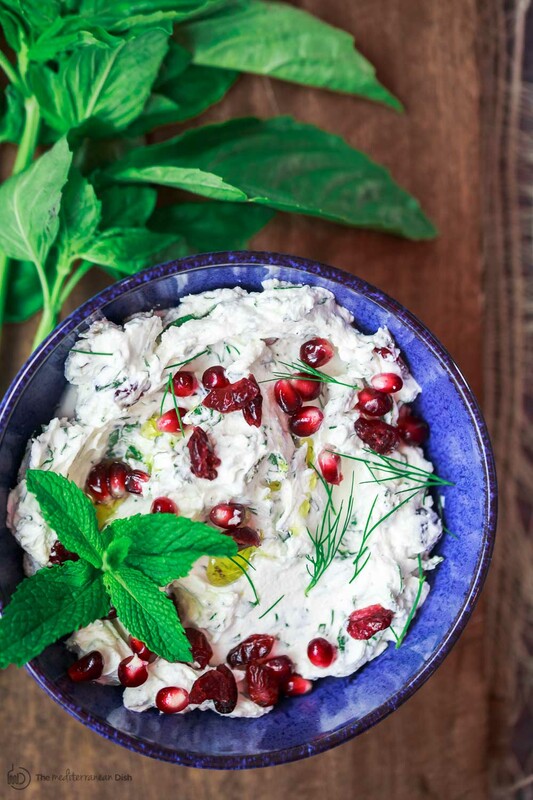 Place the labneh ingredients in one large bowl (expect the pomegranate seeds, if using), mix with a spoon until everything is well combined. Taste and adjust salt or spices to your liking. Add a little more lemon juice or olive oil, if you like. Mix again. Step 7 Transfer the herbed labneh to a serving bowl and garnish with mint leaves, more cranberries and the pomegranate seeds. Enjoy with the homemade pita chips. This recipe can be adapted using quality Greek yogurt, however, the dip will be looser as labneh is thicker than Greek yogurt.